Lazio’s failure in qualifying for the Champions League next summer has simply left a bitter taste for Biancocelesti’s coach, Edy Reja, who pretty much felt that all of their hard work has been undone in the last days of championship. However, instead of questioning Ac Milan’s seriousness in their stalemate against Udinese, which led the Zebra in getting the fourth place, Reja chose to put some of the responsibilities on his team instead. 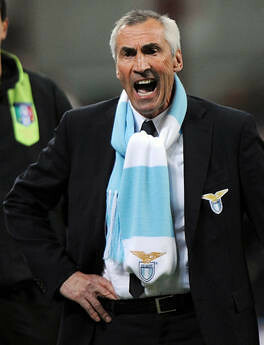 Finishing with the same point and only losing out due to goal difference, Reja believes that Lazio’s failure in getting positive result during their recent travel against Udinese, in which they suffered a 2-1 defeat with Mauro Zarate missing a penalty, was the key game that lost them the Champions League place. Beside that head to head game, the coach also stated that their inability in getting maximum points against most of the big teams in the second half of the season also what cost them the fourth place spot. It makes us very bitter, especially considering we lost the decisive match with Udinese, wasting a penalty. Clearly some of the blame has to be ours, as we also failed to get the points against big clubs,” said Reja. Trying to overcome the disappointment Reja already set himself in preparing the transfer strategy to strengthen Lazio next season and probably take another shot at competing for a much more tougher Champions League spot campaign, as from next summer there will only be three teams that can qualified to the competition. Before setting up anything, the coach first confirmed to the media that he will stay with the club for at least another season after making a personal agreement with the club’s owner, Claudio Lotito. It would be interesting to see would Reja can really improve the performance of his side and once again challenge for the Champions League spot, especially with the tighter the competition will be in the coming summer. Another good transfer market could really give them a favor in achieving their target as although making a pretty successful purchase with the addition of Hernanes this season, there’s still lack of quality depth in the squad which make the team fail to keep their consistency in the final phase of the Serie A this season, something they should really work on in the coming future.